Recently renovated, Argonne Park is has a playground with a play area abutting green space, a small picnic area, and concrete basketball and tennis courts. There is also a clubhouse and restrooms are on site. Owned by San Francisco Recreation and Parks Dept. 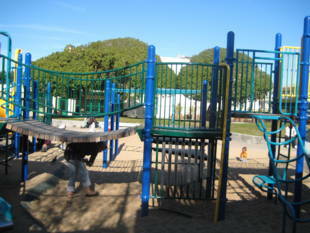 Women created the City's first playground in 1898. And women have been championing playgrounds ever since. Josephine Randall, who became the first woman Superintendent of Recreation in 1926, expanded the Department from 22 playgrounds to over 100 recreation units. When she engineered the transfer of the Argonne School Department's lot on 18th Avenue to the Recreation Commission, the lot was named after the nearby school and dedicated in November of 1926. A $2,500 allotment paid for the playground's first field house (480 sq. ft) which was built and swarming with kids by the late 20s. Worn down and out 27 years later, the little structure was replaced in 1953 with a new, 1000 sq. ft. club house. For $23,800, it provided an office, club room, kitchen, restrooms and storage space, and, like its predecessor, has been overwhelmed and outgrown by nearly 50 years of constant and vigorous use. Source: San Francisco History Center. 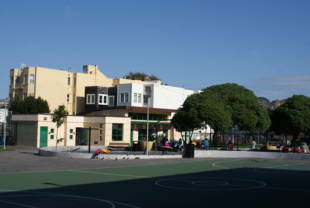 Jump cut to the Millennium and the 2000 election in which voters passed a $110 million bond to begin the renovation of the City's recreation facilities, playgrounds and parks. 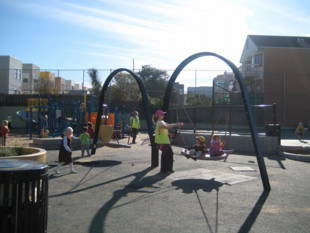 Argonne Playground was at the top of the list for rebuilding because of its less-than-welcome celebrity as 'one of the three worst playgrounds in the Bay Area' in terms of safety. A survey by CALPIRG (California Public Interest Resource Group) found that its play equipment rose to hazardous heights and lacked protective surfacing; its protrusions, and gaping holes could cause serious injury, even death; that inadequate space between swings also posed the danger of serious injuries. Argonne was scheduled for replacement in the plan's first year (2003) but after a group of parents successfully lobbied Department officials last fall, they pushed back the start date for Argonne to 2004 or 2005 and elevated Rochambeau Playground to priority position. Parents and neighbors were dismayed and outraged. 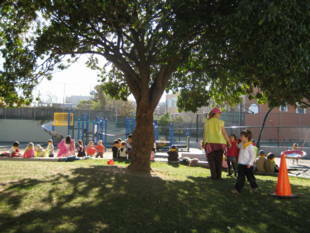 The decision triggered a meeting in July with Neighborhood Parks Council's (NPC's) Richard Bressani and Maria Morgan Butcher, president of the Friends of Rochambeau (another of the five playgrounds in District One). Maria stressed the need for Argonne to organize community workshops and start a Friends group to advocate for reinstatement on the priority list. At the first meeting, Argonne Recreation Director, Janelle Pierce, was joined by parents including Lisa Auer whose two-and-a half year-old son is a regular playground visitor. Word of mouth spread news about forming the group, and by the end of the third workshop, 100 families had signed up as Friends of Argonne Playground. Lisa, deeply concerned about the safety problems, had volunteered to take on responsibility as President. One of the first jobs she assigned to herself and her digital camera was taking a series of photos, documenting the playground's hazardous conditions and dangerous equipment. 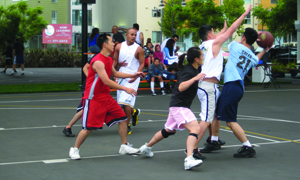 Meanwhile, with a new Friends organization in place, and noting the public censure by the Park and Open Space Advisory Committee (PROSAC) of the Department in bypassing its own Capital Plan, Rec and Park reversed its decision in October and restored Argonne to its priority position for improvement in 2003. October brought more good news. At the monthly District Park Planning meeting, Friends were joined by Supervisor Jake McGoldrick, and representatives from NPC and PROSAC. In again making the case for repairs, the Friends pointed out that former requests from the community to Rec and Park had gone unanswered. Lisa's photos provided graphic evidence of the danger and the need. And Friends of Argonne, supported by their friends, won the day. RPD sent out a maintenance crew two days after the meeting which strengthened structures, replaced rotted wood, filled holes, and repainted benches and tables. 'Although the wood is still splintery, we're very grateful to have our kids playing on safer equipment,' says Lisa. Their priority status meant that Friends of Argonne needed quickly to determine the community's own priorities for the playground. A 22-question survey created by Richard, Lisa and her friends, was printed by NPC in English, Russian and Chinese and sent to a huge mailing list. At press time, the surveys were scheduled to be returned and tabulated in December for discussion at the January meeting with park planner Lizzy Hirsch, whom RPD has assigned to the project.